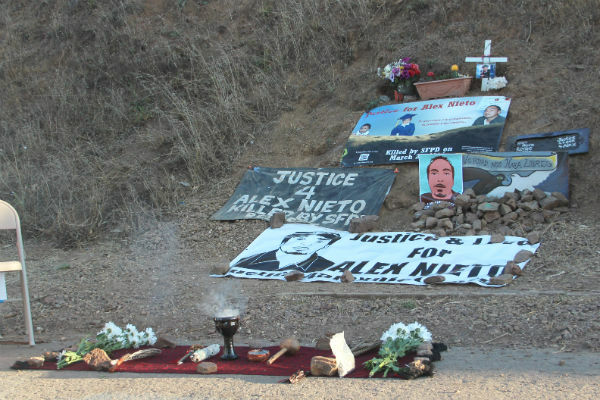 An altar on Bernal Hill commemorating Alex Nieto. Photo by Daniel Hirsch. A District Court judge ruled today that the protective order shrouding the names of police officers involved in the killing of Alex Nieto, as well as the names of witnesses to the case, would be lifted as of January 5. The decision came as part of the pretrial process in the lawsuit filed by the Nieto family against the city and police department. The officers’ names have been kept more or less confidential (though the city has now shared them with the Nieto family’s lawyer), in response to threats against the officers’ lives made by an individual apparently living abroad. The City Attorney also suggested that there is the potential threat of cyber attacks on the police department by hacker groups like Anonymous. Judge Nathanael Cousins said he was sensitive to these threats, especially in the context of the recent shooting deaths of two Brooklyn police officers. However, he said that the names of those involved in the case would not remain confidential for long. He argued that no action of the court would be able to mitigate threats to the officers and witnesses involved. Those threats were again called into question today by Adante Pointer, the attorney representing the Nieto family, who reiterated that the phone threats had come from a known individual outside the country. Nonetheless, Cousins said that without a more straightforward timeline for the threats to be resolved, the anonymity could continue indefinitely, making it prudent to set a date for the protective order to expire since it limits the plaintiff’s ability to investigate the case. Baumgartner also said the case couldn’t move forward significantly since the District Attorney’s investigation is still ongoing. She added that investigations into the threats against the officers are “active” and that a felony arrest warrant was out in one case. She indicated that actions might be taken to allow the protective order to be lifted without exposing officers and witnesses to unnecessary risk. But Pointer argued that the current arrangement, in which the city has agreed to share the names of the four officers who fired their weapons, two other involved officers, and the witnesses with the plaintiff’s attorney, still allows the defense an unfair advantage. He also argued that multiple investigations were currently open into the shooting case—namely a District Attorney investigation, a police department internal affairs investigation, and another from the Office of Citizen Complaint. According to Pointer, such a plethora makes it impractical to wait for any case imposing confidentiality restrictions to close before moving forward. Baumgartner also said the civil case’s trial date was so far in the future (in 2016) that pushing forward was unnecessary, to which Cousins replied that witnesses recollections might change or degrade over time, making it pressing to move ahead.